The twin Stromberg CD175s are fine carburetors, but they are highly precise instruments that run exacting tolerances. Unfortunately, worn Stromberg carbs aren't easy to rebuild properly and adjust correctly. Simple gasket replacements on high mileage units will not suffice and worn carburetors can create dangerous conditions in the engine. For example, worn out needles and jets can cause too rich mixture or flooding condition, resulting in fouled plugs and premature wear on rings and bearings. Worn throttle shafts allow vacuum leaks which can cause a lean gas mixture and increased combustion temperatures resulting in premature valve failure. Sadly, a common Jensen Healey problem that can be avoided. The effects of age and wear on the Strombergs will eventually make your idle almost impossible to maintain- even so-called overhauled Strombergs, the way most people do them, will still suffer from a laundry list of problems without a complete restoration. Our remanufactured Strombergs are restored to an incredibly high standard, and because of the personal attention they receive, they will function as well as new units. 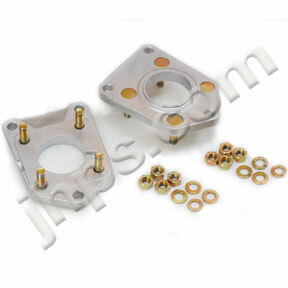 We use only high quality gaskets, seals, jets, and float valves. New throttle shafts and throttle plates are fitted as needed. Worn throttle shaft bores are repaired using modern Teflon coated bushings. Decel by-pass kits are installed. New, original specification fuel needles for the Jensen Healey are installed. Fixed fuel jets are measured and gauged for serviceability and are replaced as needed. All components are completely disassembled and all parts glass bead blasted. Accurate preliminary adjustments to factory specs are made allowing easy installation and starting. Please don't confuse our restored Strombergs with a set of carbs that have been slapped together by some casual workers in one of those sweatshop carburetor places that rebuild anything and everything. I've seen people pay hundreds of dollars for junk work and junk parts and others that have had their carbs ruined by inexperienced mechanics. If you've had enough with the Carburetor Clowns and are ready for the best, this is it. Price includes two high quality rebuilt Stromberg carburetors, complete front and rear, as pictured. Fits all years of stock, Federal model Jensen Healey and Jensen GT. Others Strombergs rebuild as requested for similair costs, but you'll need to send the carbs in to be rebuilt. All units are rebuild to a stunning, show-quality standard. All the bodies are meticuiously media blasted/polished to a beautiful satin shine and all screws and metal tubes get new, cadmium plating, bench tested, tuned and balanced ready for final installation and balancing on your car ($779). Back plates also available (with core exchange) for an additional $120.00 - plates are media blasted/polished to a beautiful satin shine and all bolts and nuts and washers are removed, cadmium plated and reassembled. Stromberg Intake Manifold also available (with core exchange) for an additional $250.00 - complete manifold is media blasted/polished to a beautiful satin shine to complement the carburetors. Please Note: we are out of cores right now, we can only rebuild the Stromberg carb set that you ship to us. We currently have a 3-4 week wait right now. We service any CD175 Zenith Stromberg Carburetor Sets from any vehicle, but you must sent us your carbs to be refurbished.